My first real roleplaying game campaign was Dark Heresy in 2008, which my friend had managed to pick up during its immediately-sold-out first print run by Black Industries. Dark Heresy was also the first game I ran myself as a fledgling GM later that year. It was serendipitous that I was able to introduce my boyfriend to the Warhammer Universe and roleplaying itself during the Dark Heresy Second Edition Beta, which as you might have heard is being revamped for rerelase next month! When asked to describe Dark Heresy in only a few words, I immediately think “Grimdark Horror Investigation.” I will always remember those scary moments of tension from the Core Rulebook adventure when we were camped out at night with something terrifying watching us just outside the camp. The real fear arose from the fact that the enemy we were facing was unseen and unknown, one we were desperately trying to uncover before it became too late. But those moments I remember so vividly are among the most difficult to bring to life as a Game Master. It’s getting close to Halloween, and the most enjoyable investigative sessions I’ve played and run have been Call of Cthulhu, Dark Heresy, and Ravenloft, so my advice is going to tie in to the horror genre as well. In order to prescribe some tips, first I’m going to look at the problems GMs like myself have faced when trying to approach investigation and mysteries. The first is crafting a suitable challenge for the PCs, one that doesn’t lead to dead-ends but isn’t a dead giveaway either. The second in ensuring plausibility, but also trying to pack in as much surprise as possible. The third is inducing drama and immersion, by raising the stakes and running the game seamlessly so they forget they’re even playing a game. If you can nail all three points (easier said than done! ), you should have a seriously awesome game session in the making. The biggest challenge is to feed the players all the necessary clues without them seeming like they’re being handed to them on a silver platter, but also not starving them into frustration with a dead end. You certainly don’t want the players to miss a crucial bit of information because they can fail a skill check. But you can have them roll to try and gain additional nuance or context about the clue that would otherwise not be obvious. This way, if they do fail, they are only missing out on “bonus” information that would allow them to reach the conclusion sooner. The GUMSHOE system addresses this by making clue acquisition automatic, but allows players to spend points from a limited pool in order to get hints as to how to interpret those clues they have found. Other systems recommend the “three clue rule,” which involves seeding the same “clue” into three different incarnations, assuming that the PCs will always be able to find at least one of them. If they do still miss a clue, or misinterpret it, you should still have a backup plan for what happens next. Let the mystery come to them. The penalty will be their lack of preparedness, they’ll still have a chance to succeed. When you’re designing clues, my advice would be to remember to consider all six senses: touch, taste, sight, sound, smell, and awareness, whether extrasensory (like psyniscience) or otherwise (like blindsight). One of the biggest revelations to hit me is a GM is that foreshadowing can work both forwards and backwards, so to speak. I’m used to the writerly way of foreshadowing: planning ahead so that I’m seeding subtle hints throughout the story that insinuate and lead up to what I’ve planned all along. But for the improvisational GM, foreshadowing can work in the opposite direction as well: you don’t know what the ending will be, but you can build off of the facts and connections previously revealed to come up with a conclusion on the fly. Possible Spoiler Alert for WFRP3’s The Enemy Within: There are three possible candidates to be the real “Black Cowl” throughout the adventure, and the default assumption is that the GM will pick one from the beginning and play the NPCs with that fact in mind. But an alternative method of running the adventure involves not deciding who is the real “Black Cowl” until after the party has played through most of the adventure and have made up their own minds as to his identity. Armed with that knowledge, the GM can either decide to reward the PCs with their hunches, or to pull the rug out from under them at the last minute, if their reasoning wasn’t well-justified given the evidence. End Spoilers. I consider red herrings and misdirection to be variations on the same theme: the GM sets up one scenario—fairly convincingly, even—then reveals it to be false, or an obvious ruse. I think that they shouldn’t be completely off limits, but neither should they be overused. They are good to use every once in a while to shake things up and make sure that your players stay on their toes and afford for every possibility, but they become old fast if you reuse them within the players’ recent memory. Instead of misleading your players and making them feel cheated, there’s something to be said for strategically withholding key information, especially in a horror-type investigation. If they realize that there’s more than what meets the eye, but they are routinely kept out of the loop, this builds tension and drama like nothing else. For a horror game especially, you want to get players “in the zone” and keep them there, where the lines between player and character are blurred and they feel as their characters would. This kind of synergy requires work from both the players and Game Master, and starts with the agreement that you’re both going to try to aim for that kind of game. One need only look at the 4chan vision of 40K roleplaying to see the ridiculous heights to which Dark Heresy can aspire (and by heights, I actually mean rock-bottom lows). There are players who want this ridiculous, hilarity-filled experience, and if that’s how they want to play their game, I won’t begrudge them that. But you can also play a serious version of Dark Heresy, one where you begin to grasp the despair and hopelessness that pervades the world that is always only one minute from midnight, and you let that grim realization settle into your character’s mind and your own. And that’s what sanity is for, children. If your players are willing to buy into this level of gameplay and roleplaying, then there’s going to be fewer chuckles or teasing when you lower the lights a little bit, light a candle, and put a good, dark ambient playlist on in the background. The best games I’ve played of this type were late at night, during a windy rainstorm, with the lights in the other rooms turned off and the Alien soundtrack on. Players are going to be paying less attention to their cell phones and having less out of character banter, because they want to see what happens next. And you’ll let the silence settle over the table after a particularly disturbing epiphany or gruesome description while the players digest what their characters have seen or heard—or worse, what they haven’t. 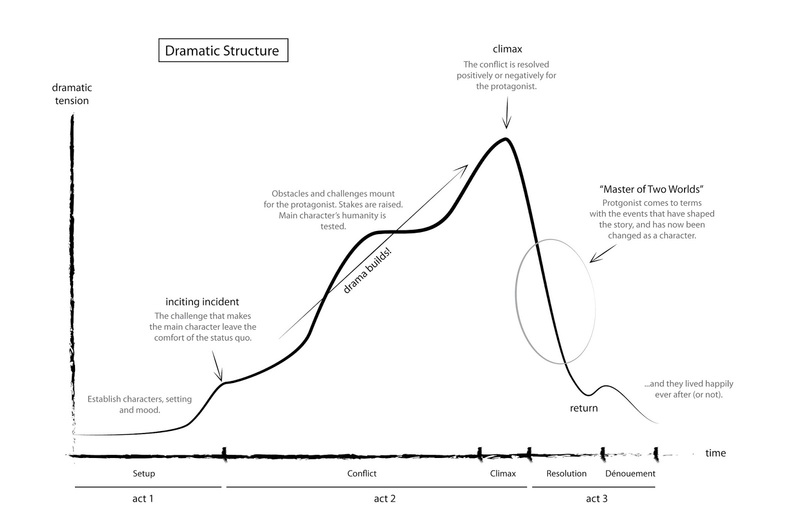 Take a look at the above tension chart for classic narratives, and consider it well. Every time the players seem to succeed, throw in a new complication that undermines that success, and don’t let up until they seem like they’re about to run out of emotional gas or after they’ve experienced an extremely tense moment. The recently-released Gravity is an excellent example of a movie that keeps on introducing new setbacks and problems for the protagonist, while also allowing for lulls in the desperation for the audience to catch their breath and allow the tension meter to reset. If by the time you’re done the graph looks something like a reverse seismograph after an earthquake, you’re doin’ it right. When looking to raise the stakes, consider the different types of conflict available in narratives: man vs. self, man vs. man, man vs. nature, and man vs. god. Let the environmental forces work against the party, and pit them against a truly threatening foe. And then, let their own imaginations get the better of them, and make them distrust their own senses and selves. This all requires you to trust in yourself as a Game Master and be confident in your ability to do a good job. If you’re worried about how you’re going to do and whether the players are going to get into it, you’re going to miss the cues you need from them to give them a good time. If you just let the session build on itself and naturally feed off of the investment of the players, you’ll do just fine. Don’t force it, let it flow. How do you run investigations and build mysteries? Link your answers in the comments below! You can find the rest of the 30 Days of Gamemastering Challenge prompts here. And stay tuned for tomorrow’s post on structure and time. Thanks again for reading! Wonderful blog entry very informative.